The presumption of the little horn leads to the cry for judgment. As the ram and the he-goat became great and then were broken (Dan. 8:4, 7-8), so the horn power exalts itself (Dan. 8:9–11). Thus, the question comes, How long will the vision be? What specific issues are prompting the question in Daniel 8:13? Although the question singles out a few activities of the horn, perhaps the most horrible ones, it still asks for the length of the entire vision; that is, it is asking about the events shown in the vision of Daniel 8 . In the Scriptures, the question “How long?” always asks for the present situation to be changed. It is found directed to people by God and by His prophets (Exod. 10:3, Num. 14:27, and 1 Kings 18:21). It is also directed to God by His people (Ps. 94:3, Rev. 6:10) and by the angel of Yahweh (Zech. 1:12). The angelic cry “How long?” (Dan. 8:13, 12:6) is a lament over continuous distress, a plea for change, and a call for divine judgment. Such a question expresses the expectation that God will finally triumph. As in Zechariah 1:13, where Yahweh replied with “gracious words, comforting words” (NASB), the answer to the question in Daniel 8:13 comes right away: Restoration will be underway beginning with a period of “2,300 evenings and mornings” ( vs. 14 , NASB). Once we understand the human condition and the prophetic time in which we live, we cannot remain silent. The cry “How long?” needs to go forth. As we look around at our world, how can we not plead for the Lord to come and usher in a new world “in which righteousness dwells” (2 Pet. 3:13, NKJV)? Although God is now at work, as promised in Daniel 8:14, we want Him to end the reign of evil here and return in the glory that He has promised time and again. In which situations have you asked God the question, “How long?” How do you maintain the assurance that God is indeed in control, however dismal your immediate prospects might seem, and no matter “how long” it is taking to resolve the things you want changed? There is so much suffering in the world but we take heart by knowing that our God is all knowing and his time is the best. There have been specific times when I have wanted my circumstances changed and have asked God, "How long?" Many times, the question has been from selfishness and not from a desire for God's will. I am glad that God is patient. He does answer my prayers even when they are selfish, but I pray to be continually growing to trust and to entrust everything to Him. He is in control, and the bad things in the world and in my own life will have an end. A few days ago I wrote on this post about being up praying about a situation that is challenging. Again, I'm up again praying "how long oh Lord?" because it's totally out of my control, and the situation weighs heavy on my mind and heart. During difficult times in my life, like I'm having now, sometimes it's hard to believe it's not necessarily "punishment" for some misdeed. I'm continuously learning that there are times because of the nature of sin in this life there are not only hardships but impossibilities. It makes me love this world less and less. This is certainly not OUR FINAL HOME. In my own situation I cry Lord, how long? There are times when He simply gives me grace to endure until He fulfills His promise. Even if it is the enemy that sends the darkness (as it usually is), Christ is still near, as the Father was near Christ even when He felt abandoned on the cross. May His grace continue to sustain you. God's time is the best, so let us pray to God and He will help us. Jer_8:7 Yea, the stork in the heaven knoweth her appointed times; and the turtle and the crane and the swallow observe the time of their coming; but my people know not the judgment of the LORD. Without a knowledge of the sanctuary it is impossible for any one of us to know the will of God at this time . the little horn has nothing to do with the cleansing of the sanctuary in heaven. the little horn was never in heaven. neither could it have enter. The little horn power was from 538 to 1798, but the cleansing of the sanctuary began in 1844, which is removing of the names those which was entered into the book that was open , and the dead was judged from the deeds recorded therein From Adam right down to our time. This work is to determined who will come up when the call is made for the first group to come from the grave 1Thes 4:17. and who will not ( names blotted out and names retained) it has nothing to do with the little horn. When this work goes over to the living both the sanctuary on earth (the Church) and the sanctuary in heaven will be cleansed at the same time , that is those that fail to live the overcomers life, their name will be blotted from the book and they will be cut of from the church on earth. as the type shows on the day of atonement. then the church will go forth fair as the moon and bright as the sun during the loud cry. no sinner in the midst. a pure church. Each one of us has a case pending before the bar of God, this is what I know the judgment to be since I joined the church in 1972. This is quoted from Sunday's lesson. "As said before, the “daily” (tamid) refers to Christ’s continual priestly mediation in the heavenly sanctuary (Heb. 7:25; 8:1- 2). The “taking away of the daily” by the horn power represents the introduction of such papal innovations as a mediating priesthood, the sacrifice of the mass, the confessional, and the worship of Mary, by which it has successfully taken away knowledge of, and reliance upon, the continual ministry of Christ in the heavenly sanctuary." The little horn has nothing to do with the cleansing. Daniel 8 is telling us that the little horn took away the "daily" by replacing Christ with worldly man-priests to mediate man to God. No matter how long there is going to be an expiring date for the activities of the little horn, then be happy because our time of restoration is here. Lord, help me not to question you but to put my trust and faith in you. As we go through these troubled times, let thy will be done Lord. For you alone are worthy to be praised. The question posed in Daniel 8:13 includes 2 entities,” the daily” and “the transgression of desolation”. If the” daily” is Christ’s sanctuary ministry, how does that trod down the sanctuary and the host? What is the “transgression of desolation? Why is that not addressed in the lesson? If the "daily" is Christ's ministry in the sanctuary and the problem is the papacy (little horn) then why would the starting date be 457 BC? We know for a surety that that is the starting date of the 2300 days, but it does not make sense when you say that this vision has to do with the papacy taking away Christ’s sanctuary ministry. The papacy did not even come into existence until 538 AD (the starting date of the 1260 years). Christ did not enter into His work as High Priest until 31 AD, if the Papal system existed at that time the prophecy would take us to the year 2331, but we know that the Papacy did not exist at that time. 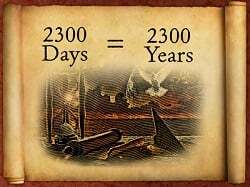 If the 2300 days is really about Christ and the Papacy then why would we be given a starting date of 457 BC?? Hi Kathy! You are correct that Christ was inaugurated as priest in heaven in 31AD when after His resurrection he went up to heaven so Christ has been serving as priest long ago even before the existence of the little horn. The period 538-1798 is inside 31 AD to 1844. When the little horn came into power in 538AD he started taking away the "daily". It does not mean that since Christ became priest in 31 AD the Papacy should have been also existing that time to take away the daily. The point here is, during the period from 31AD to 1844, there was a little horn power that took away the "daily" or the priestly ministry of Christ. There is no question here because the priestly ministry of Christ came before the existence of the Papacy. The problem only occurs when the Papacy started taking away the "daily" when Christ is not yet inaugurated as priest. To add, the prophecy did not tell us that the little horn will take away the "daily" at the start of the the 2300 days which was in 457BC. The prophecy tells us rather that the little horn will appear after the Goat/Greece or after 168 BC and it is during his reign that the taking away of the "daily" will happen. I hope you get my point. To answer your other question Kathy, when the little horn took away the "daily", what happened? The sanctuary in heaven was trodden down because Christ work as our high priest was taken away from him. The little horn took the place of Christ by introducing human priests to be intercessors to forgive sins and Mary to be a mediator between God and man. The Pope also became the Vicar of Christ and so the work of Christ was totally taken out of the picture. Our lesson says, "taking away the daily has successfully taken away KNOWLEDGE OF and RELIANCE UPON the continual ministry of Christ in the heavenly sanctuary". But when 1844 arrived, the answer to the question did not come. The Prince is still being defied, the stopping of the "daily" is still going on, and the Temple is still being ruined. What I mean is, the activity of the little horn was not stooped and there was no deliverance that happened. My question is, "How does the event in 1844 answer the question, 'How long?' when the little horn was not stopped in that year? Please do see Martin Pröbstle's introduction to the lesson. It was through the Advent movement that attention was again directed to the work of Christ in the Heavenly Sanctuary. And that's why we're studying this subject right now. Also see Tuesday's lesson as a partial answer to these questions. I believe that the question posed by Kathy is an important one, and does not seem to be adequately answered by the lesson, nor by Merwin's explanations which, though they contain useful insights, are based on the problematic premises used in the lesson. In my opinion, Merwin's rendering of the conversation depicted in Daniel 8:13 is pretty much spot on. A question is asked regarding the time period for a specific series of events involving - the daily sacrifice, the desecration of the sanctuary, and the suppression of the “host”. By my understanding, the answer given in Daniel 8:14, relates directly to the question asked. A significant issue in the question is the “daily sacrifice”. A continual sacrifice was to be given every morning and every evening in the sanctuary. This is what the 'daily' refers to, so the specific answer is given that the time period would be the same as it would take to do 2300 evening and morning sacrifices. I believe that were we to understand that this period related to days, then the word “days” would have been used. In fact I would suggest that the very reason that the phrase “evenings and mornings” was used was to ensure that such a mistake would not be made. This understanding is reinforced when we see that in Daniel 8:26 “evening” and “morning” is again specified in addition to the use of the word “days” (Hebrew: yôm) within the same verse. Merwin also poses the question, “How does the event in 1844 answer the question, 'How long?' when the little horn was not stopped in that year?” This question, along with the other aspects of Kathy's question, such as the connection between Christ's sanctuary ministry and the conversation in Daniel 8:13-14, can be answered by putting the vision of Daniel 8 into what I believe to be its proper context. As far as I see, these questions are resolved by considering that Daniel 8 has nothing whatever to do with Christ's ministry in the heavenly sanctuary at all. We are given a key to the visions: in Daniel 2 each empire is represented by a different material; in Daniel 7 each empire is represented by a different beast. Using the same key for Daniel 8, as only two animals are mentioned, only two empires are represented. Therefore Daniel 8 refers only to the time periods involving the Media-Persian and the Greek empires, and does not involve Christ's ministry on earth which did not begin until well into the Roman empire. The question must now be asked, is there any evidence that Daniel 8 refers to the Grecian period? The answer to that question is yes. Aside from other aspects of Daniel 8 that concur with historical events, the dates for the interruption of the daily sacrifice during this time are well established in history: from the 15th day of the ninth month Casleu in the 145th year to the 25th day of the same month in the 148th year (see 1 Maccabees1:54, 4:52-53). The date reckoning here uses the “Seleucid Era” and each year had 360 days, each month 30 days and an intercalery month was added between the first and second month every other year. The intercalery month plays the same function as our leap year. From the dates above we have a period of three years (3 * 360 days), two intercalary months (2 * 30 days) assuming that the 146th and 148th years were intercalary years, and ten days between the 15th and 25th day of the month Casleu. This gives us a total of 3 * 360 + 2 * 30 + 10 = 1150 days which is exactly the period which would accomplish 2300 sacrifices – one in the evening and one in the morning. This is what I believe is referred to in the question given in Daniel 8:13, and also the answer provided in Daniel 8:14. I find it very interesting that this issue should be raised during the Jewish feast of Hanukkah the commemoration of which relates to this event. Lowel, I believe you must reconsider Daniel 8 to come to a firmer conclusion than what you present above. The little horn in Daniel 8 is the same power as the 4th beast of Daniel 7 and the iron legs of Daniel 2. There is no new vision, just a different view. The line of history has no change, so the little horn of Daniel 8 must be the Roman power, with both pagan and papal reigns being illustrated. Notice how the goat waxed "very great", but the little horn waxed "exceeding great". The Seleucid empire was smaller/weaker than the united Macedonian empire under Alexander as Daniel 8:22 points out. So the little horn could not be the Seleucid kingdom, which never waxed to the east or south as Rome did, coming from the west. On a list of world empires, the Roman Empire is listed above the Seleucid empire and Macedonian empires, the Seleucid actually being way down the list about 40 positions below Rome and 30-something below the Macedonian. So the details don't fit the Seleucid empire in any regard when the facts are considered in both the prophecy and history. It never waxed toward the pleasant land since it already controlled it when the Macedonian empire was divided into 4 smaller empires. As with the other 3 divisions, the Seleucid slowly diminished until Rome controlled the region. The 2300 days are years and must be to fit the timeline presented in the figures of the little horn which itself would operate for 1260 years (as revealed in Daniel 7), within the 2300 day period that started before even the Macedonian empire had ascended. The 2300 day starting point is during the reign of the Ram power and extends beyond the little horn's reign of 1260 years. 2300 literal days would not fit this span of time. As per your suggestion I have given Daniel 8 more consideration, the results of which I will share with you below. With regard to the visions in Daniel 2, Daniel 7 and Daniel 8, I believe the key provided within them is so strong that the views presented are clearly defined, and that God's time-line is implicit. Rather then repeat it here please allow me to refer you to the fuller explanation that I gave in a comment on the Sabbath Afternoon's lesson http://ssnet.org/blog/2013/11/sabbath-the-eschatological-day-of-atonement/comment-page-1/#comment-54633. Further to the explanation given above, here is an additional thought to consider. You stated that, “There is no new vision, just a different view.” What I understand that you are saying is, that all the visions present the same information. I do not see this to be the case. Daniel 8 does have elements of the other two visions, but there is a significant omission. Ignoring the absence of the Babylonian empire (Daniel was then living in the Media-Persian empire) and that you would have the little-horn as Rome, Daniel 8 does not contain the detailed information relating to God's final kingdom that appears in both the other visions (Daniel 2:34-35,44; Daniel 7:14,22,27). As far as I see, the Daniel 8 vision presents a subset of the other two, focussing primarily on the Greek Seleucid empire. You pointed out that, “The goat waxed 'very great', but the little horn waxed 'exceeding great.” (Daniel 8:8-9) The understanding being that the little horn kingdom was greater than the original Greek empire. In reconsidering this point, I did an analysis of the Hebrew word, “Yether” translated as the phrase “waxed exceeding” in Daniel 8:9. The word is used 101 times in the old testament, and 90 of those uses are translated as “Residue”, “Left”, “Remnant” or “Rest” (as in “rest of”). In only 3 cases is the word translated with a meaning close to “exceeding”: “Plentifully” (Psalms 31:23), “More” (Isaiah 56:12) and “Exceeding” (Daniel 8:9). What this suggests to me is that the translation of the Hebrew word, “Yether” as the phrase “wax exceeding great”, is incorrect. I would say that with 90% confidence Daniel 8:9 should read something like, “And out of one of them came forth a little horn, which remained great to the south and toward the east, and toward the pleasant land.” This is an exact description of the Seleucid empire which was the biggest by far of the four Diadochian kingdoms, being about four times as big as the next largest. It extended as far east as the Indian border and south to the Persian Gulf and the Indian Ocean. It also included Israel, the “Pleasant Land”. Concluding this point, I believe that Daniel 8:8-9 does not say that the little horn kingdom is greater than the original Greek empire. It should also be noted that the Hebrew word, “m'od” translated as “waxed very” (Daniel 8:8) is also translated as “Exceeding” and “Exceedingly” several times in the old testament. I believe that this tells us that Daniel 8 provides a stunningly accurate description of Antiochus Epiphanes and his actions. (See 1 Maccabees and Josephus' “The War of the Jews” for historical information about Antiochus Epiphanes). Antiochus Epiphanes came to control the massive Seleucid empire by intrigue (Daniel 8:8-9,24,25): he did not conquer it himself. The kingdom's geography is well described (Daniel 8:9). Unlike Alexander the Great, who was very liberal with the different peoples in his empire, Antiochus Epiphanes actually forbade the worship of God in Israel, and imposed severe and vicious punishments for those who tried to do so (Daniel 8:10). For instance, circumcision of babies was forbidden. If a mother was found to have done so, then the baby was killed in her sight before she herself was killed. Antiochus Epiphanes even sponsored his own high priest (Daniel 8:11). He caused the daily temple sacrifices to cease for exactly the time period given in Daniel 8:14,26 (see my comment above). It was after this period that the sanctuary in Jerusalem was cleansed. It should also be noted that the cleansing of the sanctuary at this time has been commemorated until this day, and was also celebrated by Jesus himself (John 10:22). Hanukkah, the Feast of Dedication, is one of the two feast celebrated by the Jews which was not instituted by Jehovah (the other is Purim). Antiochus Epiphanes eventually died, of depression apparently, not in battle nor by any human agency (Daniel 8:25). Hi Lowel, the only problems I see with your theory are that horns represents kingdoms and Antiochus was only an individual king, a part of the four horns. Plus he never became "exceedingly great. Also he did not appear at the "latter end." He only interrupted the temple services for three years and ten days, not 2300 days. See Maccabees 1:54-59 and 4:52-54. It is brilliant if the only problems with my theory that you see are as you described. All of the problems can be addressed, some of which I had already done so, but seem to not have made clear. I also think you may have missed those that I addressed in earlier comments. The first point is not really an issue as it is not my theory that the little horn is an individual king, it is clearly stated in Daniel 8:23. In fact Gabriel describes all the horns of the goat as kings, either explicitly or implicitly. The great goat horn was the first king of the Greek empire and is clearly distinguished from the Greek empire (Daniel 8:21). The vision imagery of the four horns and the little horn coming out of one of them might also be seen as indicating that the little horn was the progeny of one of the four, which indeed Antiochus Epiphanes was (though he was not direct in line to the throne). This may be taken to imply that the four horns represent four kings or kingly lines, which we know from history is the case. In truth, it would be unusual to have a kingdom without a king. A significant point in my December 8 comment above was in reply to Robert Whiteman's comment (December 7) where he pointed out that the Seleucid empire, over which Antiochus was king, was smaller/weaker than the Alexander the Great's kingdom. I am happy to concede this. However, what I hoped that I had made clear in that comment (in paragraph two) is that I am 90% certain that the little-horn was never described as being “exceeding great” and I believe this to be a mistranslation of the Hebrew word, “Yether”. I suggested the rendering of Daniel 8:9 to be something like “And out of one of them came forth a little horn, which remained great to the south and toward the east, and toward the pleasant land.” Thus accurately describing the empire's geography, and also signifying that, though the little-horn king came after the kingdom's foundation, his territory was not diminished. Gabriel stated that the king of fierce countenance, represented by the little horn, appeared in the latter time of the four kingdoms (Daniel 8:22-23). In my understanding the phrase, “Latter time” is properly qualified as referring to the time of the four kingdoms, and should not be confused with the, “Latter days” of this world. Antiochus Epiphanes was the last great King of the Seleucid empire (http://en.wikipedia.org/wiki/Antiochus_IV) He lived 175-164 BC. The Greek empire ranged from 808-167 BC (http://en.wikipedia.org/wiki/Macedon). I think it is fair to say that Antiochus Ephiphanes came to power in the last years of the Greek rule. I think that I fully covered the issue of the 2300 evenings and mornings in my December 6 comment above, which I suspect you may have missed. Lowel, every English translation of Daniel 8:9 disagrees with your translation of yether, with the common understanding being that the little horn grew/gained/waxed into the directions stated, being eastward and southward, toward the pleasant land. The Seleucid empire lay to the east, and never waxed in any direction during the reign of Antiochus IV, who was the 8th of 31 rulers for that empire, reigning from 311 - 63 BC, placing Antiochus IV near the mid-point, not the latter end. When the Jewish transgressors came to the full, it was Rome who was the prominent power, which also destroyed the place of the sanctuary, not Antiochus IV, who's reign began the steady decline of the Seleucid kingdom according to the reference you give. He bowed to Rome's insistence that he return at once from his designs against Ptolemy or face war, which he dared not risk against the already "exceeding great" power of Rome. More than one commentator suggest the gender of the pronoun "them" in verse 9 would favor the four winds, not the four horns, which agrees with history. Any map of the 4 divisions of Greece shows Rome outside of their territories, to the west. To follow the text accurately while assuming the little horn proceeds from one of the four horns, it would have to come from either Cassander or Lysimachus, neither of which existed at the time of Antiochus IV or when the "transgressors are come to the full" during the early part of the 1st century AD. This fulfills the 70 weeks of Daniel 9, which is part of the vision of Daniel 8 according to Gabriel in chapter 9. When we fail to match all the details in a prophecy, we need to reconsider our conclusions. God is precise and makes no mistakes, and there is no room for partial agreement. It must fit perfectly or it doesn't fit. When you consider the time element for these events, Antiochus IV is no longer alive, dying over 150 years prior. Another point to consider is the term "little horn". Some say more accurately written as "a horn that began little" which fits Rome, not any Seleucid king since their territory never expanded from a small state, being the largest division of the Macedonian empire. In fact, it was reduced in size during Antiochus IV's reign by King Mithridates I of Parthia , who Antiochus IV went to fight against at the time of his death. Antiochus IV, though a popular interpretation of this little horn, simply doesn't fit the exact details given in the vision and the explanation by Gabriel. Kathy, the little horn in Daniel 8 is the same little horn of Daniel 7, at least it's later existence in taking away the ministry of Christ for sinners by substituting a false "gospel" of superstitious works, worship of saints and relics, and a counterfeit priesthood. The little horn in Daniel 7 would persecute for 1260 years, not 2300 years. The 2300 years was only to give us the knowledge of when the cleansing of the sanctuary would begin, and was tied together with the 70 weeks of Daniel 9, concerning the Jews and their city. Two events tied to the same starting point, but not directly related. My understanding of treading down the sanctuary is when the gospel of God's grace, as taught in the sanctuary services, was replaced with the false doctrines of the papal church. This in effect "removed" the ministry of Jesus with the errors that were taught for centuries, with God's word being banned, burned and God's faithful people treated as heretics. As for the transgression of desolation, that would be the rebellion of Jerusalem and it's people which led them to reject Jesus as their Messiah, putting Him to death while claiming they had no king but Caesar. This act "finished the transgression" which caused Jesus to pronounce them desolate. God could no longer forgive a people who no longer repented, but rather they persecuted both Jesus and His apostles up to and after their probation ended at the end of the 70 weeks (490 years) of Daniel 9. These prophecies are all connected and simply differing views of the same history, and the details from each, when combined, give a complete picture of that history, which continues today and will finish soon. "If the” daily” is Christ’s sanctuary ministry, how does that tred down the sanctuary and the host?" That daily is trodden down by the "horn" system here on earth, in the same way as Christ and His blood are trodden down in Hebrews 10:29. It is not literally trodden down (as literally walking on them), but spiritually and mentally in the beliefs and actions of the people. The "the “transgression of desolation" takes away from the view of the people Christ's work of salvation. Nothing can more desolating than that. It made merchandize of salvation -- of people's souls. "why would the starting date be 457 BC"
Because the question asks "How long the vision"
The vision begins with Media Persia and ends with the beginning of the cleansing of the sanctuary. The other questions on time (How long the removal of the daily and the transgression) are not answered until we reach Daniel 12 and the time lines there. Ulicia, the daily is sanctuary language for "gospel". It represented the continual offer of grace from God through the Lamb of God, typified by lambs, goats, etc. They were continually offered. Also the lamps burned continually and the shew bread was continually placed on the table. All these types taught God's grace toward sinners, which the papal system "trampled" on by offering works of penitence, indulgences, worship of relics and repetitive prayers to earn absolution for sin. It was a false system that came into the Christian church, and saved no one, removing even the Word of God as the rule of faith, relying instead on popes, priests with many traditions and forms of pagan rituals. It is easy to go off track on details which are not quite clear. While we examine the details let us maintain a view of the big picture and benefit from the illumination offered by the "lesser light," the EGW testimonies.